In a speech in Washington, the former taoiseach also attacks conventional political thinking in advance of the crisis. 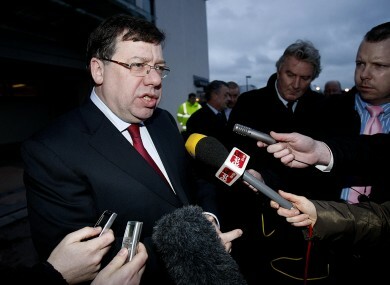 FORMER TAOISEACH Brian Cowen has compared the onset of the 2008 economic crisis to a series of plane crashes, all taking place at the same time and each for different reasons. In a speech delivered at Georgetown University in Washington, Cowen argued that the simultaneous banking and sovereign debt crises that began under his watch were not solely the fault of international factors, but also down to the design of the euro. “In some respects the Euro crisis is like multiple plane crashes occurring at the same time where manufacturing design faults, exceptional conditions, pilot errors and mistakes by air traffic controllers all led to disastrous and unexpected results,” he said. The former taoiseach and minister for finance said that while some would expect him, as a former European leader, to blame the crisis on international factors like the collapse of Lehman Brothers, this was not solely the case. There were European factors to blame too, he argued – such as the euro’s failure to accommodate the “great divergence in the strengths and weaknesses of individual countries”. “For example, Spain, Germany, Ireland, Italy, Portugal, Greece, and France all have very different problems and very different prospects,” Cowen said, saying the European crisis was “result of the interaction between the global market factors and weaknesses in individual economies”. The former Laois-Offaly TD told his audience that similar problems could be prevented if governments were encouraged to build greater surpluses instead of increasing their spending in line with tax. He added that this had not been encouraged in Ireland, however, because there was no political appetite anywhere in Ireland to cut down government spending as long as exchequer revenues remained solid. “With the benefit of hindsight, budgetary policy should have leaned more heavily against the wind – but let’s be clear about what that would have meant. A countercyclical policy stance would probably have required budget surpluses of 5-6 per cent of GDP and an unemployment rate around 7 per cent. The question we ought to reflect upon is whether the political system could have come up with such an outcome in the context of strong economic growth and widespread confidence about continued strong performance. In Ireland’s case, he said, this had not been put forward by political parties – who instead wanted to debate “how best tospend the extra resources that were coming in to the Exchequer”. Email “Cowen compares banking crisis to 'multiple plane crashes occurring at once'”. Feedback on “Cowen compares banking crisis to 'multiple plane crashes occurring at once'”.